We will be using this screen to create purchase orders whenever we buy something from our vendors. It’s important to keep a track of all our purchases in a systematic way. On this screen you can create a purchase order to send purchase request to vendors and then receive the purchase order in manage PO screen once you receive the product from them or you can create and receive the PO at the same time in create PO screen if you don’t need to send any Purchase quotation or request to place an order request to vendor. Ship From Vendor : Please select the vendor name who is selling goods to you. On this field you can either type the vendor name or type *. * to select the vendor from the list of all vendor records. product lines. For details on Product Line, please read ‘Product Line Overview’. Select Branch : If you are a multi branch company, please select the branch where you will be receiving the product. For single branch company, this field will always display company name. Vendor Ref. No. : If your vendor has shared any ref number with you related to this purchase order, you can mention that number here. Ship From Vendor Address : Ship vendor which you have selected in Ship From Vendor field, address for that vendor will auto populate here. 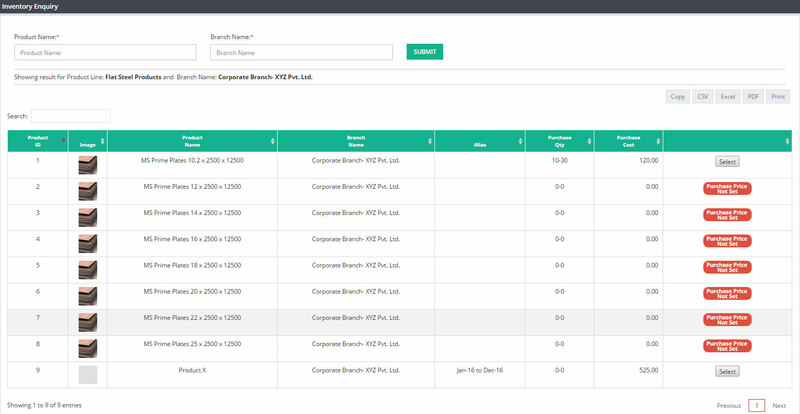 Pay To Vendor Address : Ship from vendor which you have selected, if that has got different address or branch to receive payment, then system will display the pay-to vendor address on this screen. Product Description : Please click on the small icon next to product description field, Inventory Enquiry screen will appear. You can review product image, pricing details and few other details there and then select the correct product which you have ordered or want to order. 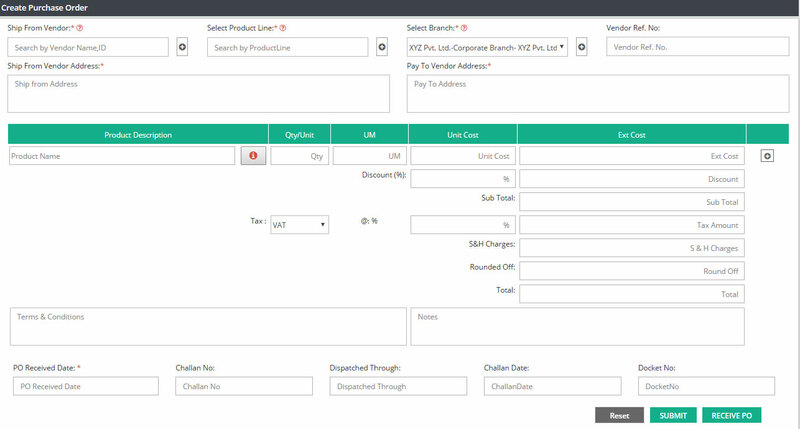 Once you click on select, product will be automatically added in create PO product description field and unit cost amount will also be updated automatically if Purchase Cost has already been defined through price sheet for this product. Qty/Unit : Please enter the Qty./Unit which you have ordered. UM : Default unit of measure which you have added in product while creating the product record, that information will auto populate in UM field. unit cost amount will auto populate, else please enter the amount manually. Ext. Cost : (Unit cost * Total Qty or Unit = Ext Cost). Amount will be calculated automatically on this field. 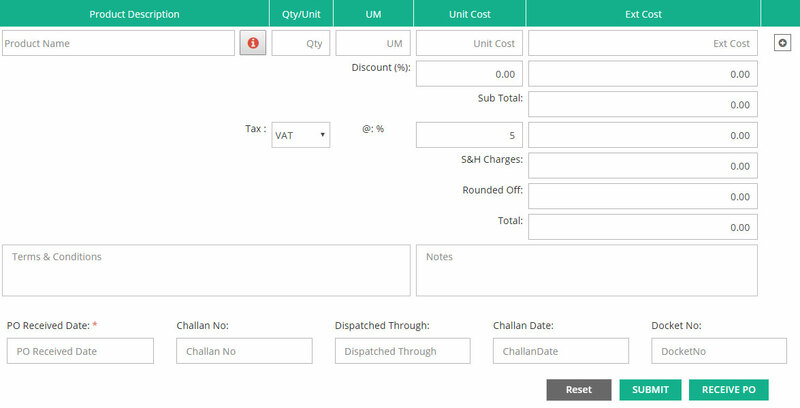 Discount (%) : If you have mentioned any discount % in vendor account, then that % will appear here on this screen and discount amount will be calculated. You can add the discount % manually or keep this field blank for no discount. Tax : If you have already updated VAT/CST/GST details in product line or vendor account which you have selected here, then tax information will be system populated else please select VAT, CST or GST from Tax drop down box and enter the %. S&H Charges : Please enter the S&H charges amount if your vendor wants you to pay courier charges along with product purchase amount. Rounded Off : For an example 100.50 to 100.99 will become 101.00 and 100.49 to 100.01will become 100.00. Total : Total amount which you need to pay your vendor for this purchase order. Terms & Conditions : This will display the vendor’s term and conditions. Notes : Please add purchase order internal notes here. PO Received Date : If you are receiving the PO at the time of creating, then please enter the PO received date here. If you a creating a purchase request copy, then please keep this field blank. You will be adding this PO received date in manage PO screen. Challan No. : Please enter the challan no if you have any. Dispatched Through : If you want to maintain the courier details, then please enter the courier name who delivered the material to you. Challan Date : Please enter the challan date if applicable. Docket No. : Please enter the docket no if applicable. Once you have entered all the details please click on Submit to generate a purchase request reference record or click on Receive PO to mark this purchase order as received. Submit : Please click on submit when you are not marking this PO as received. PO will be in open status and you will be able to receive them in Manage PO screen later on . Receive PO : Please click on receive PO if you want to mark this PO as received. Once you click on ‘Receive PO’, Purchase order copy will be generated along with Product location details to stock the products in their designated location after receiving. In case if you need to add multiple products in one PO, then please click on the icon next to Ext Cost field in order to add lines to enter more products. To view, edit, return and download PO please go to Manage PO screen.